I developed the instruments I now use on television from instruments used in the original lumia process. The first one was an instrument using candles, which was built in 1751. As far back as 1895 there was an instrument which mixed light from an organ keyboard. In 1925 there was a flurry of interest in lumia, and there were many performances of it. It was very pretty but it was used without music and died down. Well I’ve done a little investigation into Lumia, and the related art of ‘colour music’, in the past, so here’s my historical gloss on the Wyver blog post, with particular emphasis on the colour organ, a device for playing colour music. Colour music, or the art of combining musical effects with colours with correlations of harmonic and emotional effect, has a long history. First imagined by Aristotle, and speculated upon by the 16th-century artist Archimboldo, its first practical exponent may have been Louis-Bertrand Castel, a Jesuit priest and mathematician, who in the 1720s began work on his ‘clavecin oculaire’, or ‘harpsichord for the eyes’. This sought to relate the seven colours of the spectrum to a musical scale – though Castel chose to work from an irregular scale of thirteen notes that had been devised by Castel’s fellow Jesuit, Athanasius Kircher (supposed progenitor of the magic lantern). Castel’s invention featured lanterns, candles or colour boxes, but a working model seems never to have been demonstrated. The idea was picked up by various theorists, notably Erasmus Darwin, who in 1789 proposed the creation of a visual music through accompanying musical performance with light from oil lamps projected through coloured glass. In the mid to late nineteenth century a number of colour organs and related instruments were constructed. The American artist Bainbridge Bishop in 1877 constructed a projector to be fixed to the top of an organ, which would project coloured light onto a small screen; and artist Alexander Wallace Rimington patented his Colour Organ in 1893. 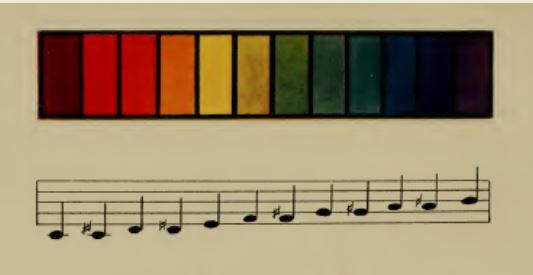 Rimington became the best known theorist and exponent of the art of colour music, which he demonstrated at several concerts throughout 1895. The concept of combining colour with music in pursuit of a pure synthesis of light and sound was taken up in the twentieth century by such composers as Schoenberg (Die Glückliche Hand, 1909-1913) and notably Scriabin, whose Prometheus, the Poem of Fire (1911) calls for the use of a colour organ, with the colours projected on a large screen above the orchestra; while from the other direction artists introduced sound into their work, notably Kandinsky in his 1914 (but not performed until the 1960s) abstract music drama, The Yellow Sound. The American dancer Loie Fuller, with her serpentine dances of the 1890s that featured her flowing dress lit up with projected lights to create colour effects was another pioneer of the idealistic combination of colour projection and music. Film animators such as Viking Eggeling, Oskar Fischinger and Walter Ruttmann each took further the wish to combine colour, movement and sound in the search of abstract form and synthesis – Fischinger in particular would go further by developing his own version of the colour organ, the Lumigraph, in the 1940s. Such experiments have continued, reaching their most popular outcome in the light performances that accompany rock concerts, their most ubiquitous form in the use of colour visualations in computer and phone media players, and perhaps an aesthetic peak in the ‘star gate’ sequence from Stanley Kubrick’s 2001: A Space Odyssey (1968). The colour organ itself enjoyed its greatest period of popularity in the 1920s, with the American colour organist Mary Hallock Greenewalt (who first experimented with the form in 1906); the Danish-American Thomas Wilfred, whose Clavilux employed a keyboard with sliding keys that controlled light projections (it was Wilfred who named his colour projections ‘Lumia’, which he preferred to have exhibited silently as moving art forms – as they appear in Terrence Malick’s film Tree of Life, for example); and Adrian Klein, creator of the Klein Colour Projector, whose remarkable book Colour-Music (1926) is an exhaustive study of colour music, its theory and potential. Klein also wrote major books on colour cinematography, and as Adrian Cornwell-Clyne managed the important Dufaycolor film process in Britain. Alexander Wallace Rimington (1854-1918) was Professor of Fine Arts at Queen’s College, London and a water-colourist, whose studies of Turner led him to pursue his own ideas of a new language of art. He wrote a talk for the debut performance of his Colour Organ at the St James’s Hall, London, 6 June 1895. It was subsequently published as a paper, entitled A New Art: Colour-Music, and is reproduced in Klein’s book along with newspaper notices and the patent drawings (Klein was another artist who turned his eye to music). His Colour Organ was a somewhat unwieldy instrument, with a battery of arc lamps positioned in parallel high above a conventional organ console. The colours were projected onto a large screen. The organ was accompanied by piano and orchestra (the latter conducted by Louis N. Parker, later famous as a producer of pageants), and the programme featured music by Wagner, Dvorak, Chopin and Gounod. Other concerts then followed, which enjoyed a mixed reception, partly owing to poor stage management. A performance at the Free Trade Hall, Manchester, on 30 November 1895 saw confusion from an audience which had imagined that by some marvellous new scientific discovery it was the sounds themselves that were producing the colours. Rimington was uncomfortable with public performance, and gave no more demonstrations after 1895. He wrote a book, Colour-Music: The Art of Mobile Colour in 1911, and in 1914 was invited by Sir Henry Wood to supervise the colour organ for a performance of Scriabin’s Prometheus at the Queen’s Hall, but the War intervened. Until now colour to a large extent in nature, and altogether in art, has been presented to us without mobility and almost invariably associated with form. Colour combined with form has constituted the whole colour art of the world. In painting colour has been used only as one of the elements in a picture, although perhaps the greatest source of beauty. We have not yet had pictures in which there is neither form nor subject, but only pure colour. Even the most advanced impressionism has not carried us thus far. In decorative art colour has, broadly speaking, held the same position. Moreover, to obtain particular tints of colour it has been necessary to mix them laboriously on the palette or in the dye-house. Art hitherto has not been able to compete in any sort of way with Nature in the mobility of her multitudinous and ever-varying combinations of colour. There has, in fact, been no pure colour art dealing with colour alone, and trusting solely to all the subtle and marvellous changes and combinations of which colour is capable as the means of its expression. The object of the present invention is to lay the first stone towards the building up of such an art in the future. The chief problem, then, that the new art sets itself is to introduce mobility into colour, and with this changefulness, the three great influences of Time, Rhythm, and Combination, slow or rapid and varied. Colour thus is freed from the trammels of form, and dealt with for the sake of its own loveliness. [I]t must have appeared doubtful to many whether there is any parallelism between the kinds of emotion produced by a piece of music rendered into sound in the ordinary way, and by its translation into colour as given by Mr Rimington. The tints with which the screen was filled were often very beautiful, if rather suggestive at times of ‘crushed strawberry’ and colours of that style, but they seemed unsatisfying, and did not convey the same impression to the mind as the music. There is perhaps force in the suggestion that our eyes are not yet sufficiently practised to make us competent judges of colour as expressive of emotion; but it may be remarked that even were the physical analogy between sound and colour complete which it is far from being it does not follow that the emotional effects are analogous. Mr Rimington, indeed, claims that his new art is not dependent upon the demonstration of the analogy; but, seeing that his instrument is constructed on the assumption that it does hold good, the point may not improperly be taken into account in considering the results obtained. But if Rimington’s instrument was limited in its effectiveness, and if his theory of colour music was flawed and rather fell apart in performance, his passionate idealism demands respect. His rhapsodic description of pure colour, ‘freed from the trammels of form’, far in advance of most of the visual arts at this time (including his own art), soars above the mechanical realities and the mismanaged exhibitions which characterised the Colour Organ’s brief public turn in 1895. While the experimenters of the twentieth century who experimented with colour music seem of their time in engaging with abstract art – Scriabin, Wilfred, Fischinger, Mary Ellen Bute and others – Rimington the Victorian is the one who made the further leap imaginatively from the art that he knew to the art of his dreams. But how did a Victorian art professor come to construct such an organ? His is the only name on the patent. What help did he receive? Who actually built it? And whatever became of it? 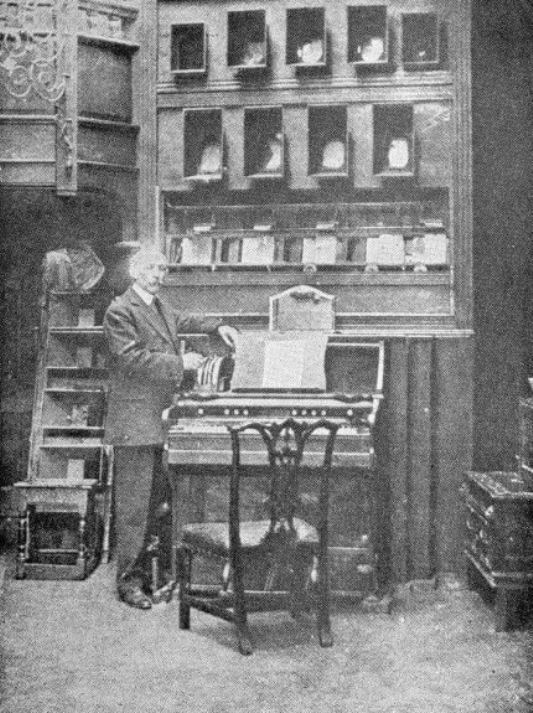 The Colour Organ was located in Rimington’s home at 26 Kensington Park Gardens until 1914, certainly, but then what? I have searched where I can and have found no trace, online at least. Does anyone know what happened to it, if it survives? It would be grand to hear and see it played again. Note: This post is an adaptation and expansion of an introduction I wrote to Wallace Rimington’s 1895 paper A New Art: Colour Music, for Living Pictures: The Journal of the Popular and Projected Image before 1914 (vol. 2 no. 2, 2003, a special issue on colour).